If you ask the general student body what they know about the Rutgers University Student Assembly, also known as RUSA, you're guaranteed to get people who don't know who they are, what they do, or just how much of an impact they have on campus until suddenly students start campaigning for votes to become our student body president. To help you learn a little more about this semester's RUSA elections, The Tab Rutgers is profiling some of the tickets running. Last week we talked to uKnighted, and this week we're talking to UnscrewRU's Top 3. 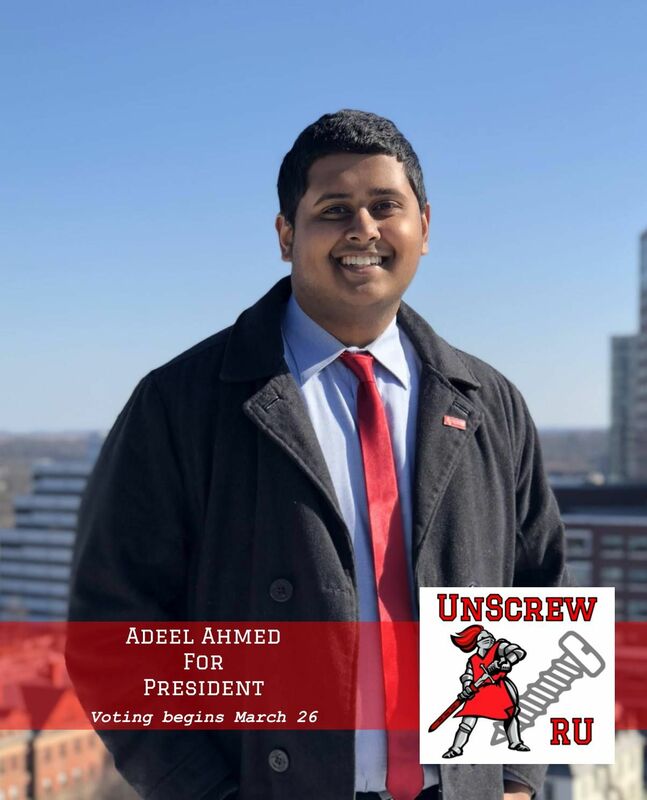 Adeel Ahmed is a junior majoring in Political Science and Philosophy and is running for President. He is currently an SAS Senator-At-Large for RUSA and a chairman of the Civic Engagement Task Force. Additionally he is the co-president of RU Progressive and has experience volunteering and interning for major political campaigns. Nimra Jaqob is a junior and a Public Relations and Strategic Public Communications major running for Vice President. Eryn Meng is a junior double majoring in Management and Business Analytics and Information Technology. 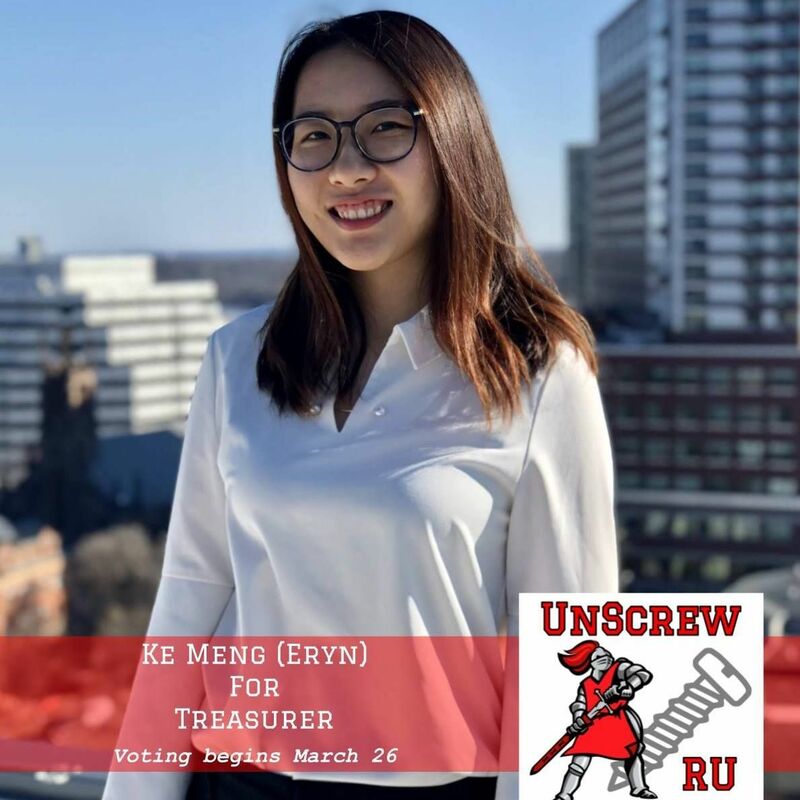 She is running for Treasurer, and is an international student orientation volunteer at Rutgers Global, and serves as the Vice President of Rutgers Global Network. Why did you select the position you're running for? Adeel: I’ve been in RUSA for about 2, 3 years now, last year I ran for Vice President, the year before I ran for Off-campus Rep. The biggest reason I am running for president is because as the time passed, I got more involved. Not just in politics but in student government and I also started getting contact with Rutgers-Newark and Rutgers-Camden. I started realizing that a lot of us are detached – everyone is trying to solve the issues, they all care about the same thing, but they’re all very isolated from each other. The biggest reason I’m running is because I feel that I’m a bridge-builder. I’ve been heavily involved with the activists, and the student government. Both sides don’t really trust each other. I kind of noticed that the way RUSA looks at activists is that they’re just people who get rowdy and don’t work with administrators to get change. There’s a lot of people in the activist community that see student government as people that only listen to the administration and don’t listen to students; they’re super bureaucratic. I want to end that stigma and bring both of them together. We both care about solving the issues, but each of us have a different role with going about it. Why don’t we sit down at the same table and discuss how we can play our roles and work together? I feel like at the end of the day if students are just organizing against students that’s very sad and I want to end that. Also, if there’s anything I’ve noticed it’s that RUSA creates legislation, presents it to the State Assembly and then it gets presented to the Higher Education Committee, it gets passed into the committee, and then it never gets passed into State Assembly, then it dies and we create a new bill. What we come up with is going to affect Newark and Camden too, so these are all things I want to change. 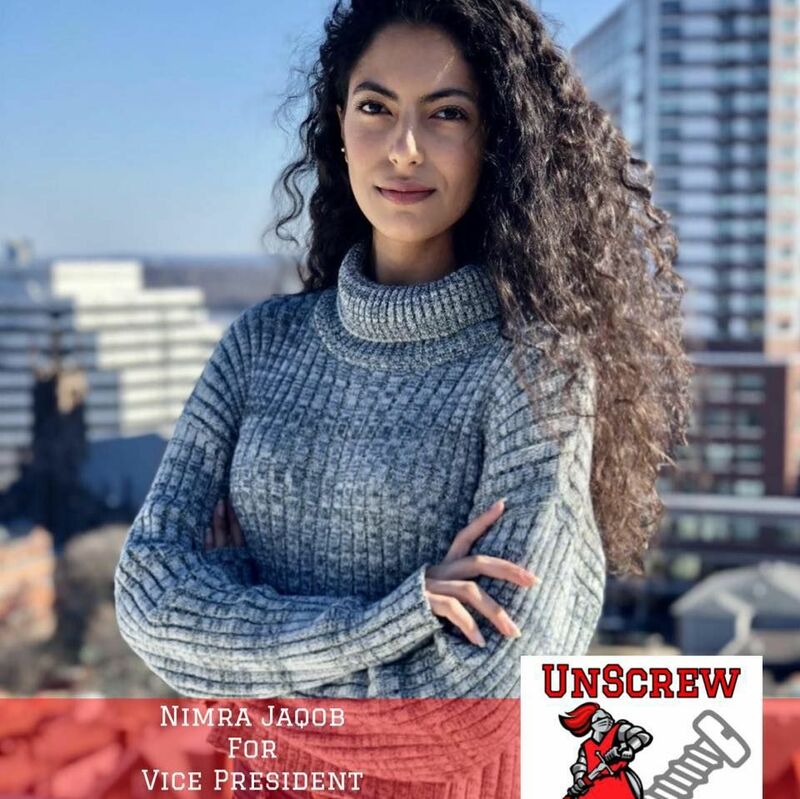 Nimra: So because of who I am and how I am, I know that I represent a lot of people who are minorities, whether they are commuters, whether they be South Asian, and at Rutgers this is a population that isn’t as represented or they don’t know much about RUSA or they are just not sure how to get involved or make real change. So I wanted to be there as this image of, ‘If I’m able to do it, then so can you.’ If I was able to get involved in student government, if I was able to push through as a commuter, then so can everybody else. Anyone who feels like they aren’t represented, who feels like they don’t know how to get change, they can be active as a Rutgers student. I also really agree with Adeel on creating an inclusive environment in RUSA. I feel like reaching out to different organizations that come from different backgrounds and stand for different issues should be a priority. That’s what really led me to run for VP along with Adeel. Eryn: One of the biggest reasons why I wanted to join RUSA is because I’m involved in many international activities, and as we know international students are one of the biggest minorities on campus. Every year we have more than 2,000 international students but most of them have no idea what RUSA is and how they can get involved in student government. If they have any problems that arise they don’t know where they can go, so that’s why I want to be a bridge, to fill in the gap in all this. I found that there are many opportunities for international students but they can’t get access to the resources so that’s what I want to do. The reason why I’m running for treasurer is because as a senior at Rutgers Business School, I have some knowledge of accounting and business things so I think this position might be better for me. What does running for RUSA mean to you personally? Adeel: A huge aspect of this ticket is to make sure forgotten voices are heard. You barely see international students involved in RUSA. And then as a Muslim, we have a lot of things now like a chaplain, prayer rooms, but if we go back a few years ago we didn’t have that. The Muslim community years back basically had to go and ask that they get a prayer space and voice their other needs. And as they got together and did that, administration realized that it’s not just one or two Muslims, it’s hundreds of Muslims coming together and saying they need this now, so it’s obviously very urgent. It ultimately comes down to members of those communities bargaining for each other. So sometimes even when those communities have to organize themselves, they don’t know the right resources, as Eryn mentioned. I think it’s RUSA’s job to go up to students and ask, “How can we help you?” I feel like a huge problem with RUSA is that it waits for people to come to them. As student government, we should be the ones going to people. We should go to other organizations’ events and get really involved in their activities. Around a month or two ago I went to a karaoke event for the International Students Association and we were just having fun, it was me and a few RUSA members, and we won and they gave us our awards and stuff. So when we were thanking them for a good time, they were like, ‘No, thank you, because our organization exists because of you.’ That really touched me, and that connection is something I think we’re really out of touch with and we need to build that connection. Nimra: It’s definitely about equal representation. I think it’s important for so many different students to be involved in student government. It’s been around a year, year and a half since I’ve been in RUSA and I’ve seen how students can get together and make change and meet with administration to voice their concerns. Knowing that and knowing how we can get issues solved and how we can come together, if many different voices were part of it, it’d be a beautiful thing. Coming from different backgrounds to voice their perspectives on something, so much can be done and so much can happen. Everyone’s got their own opinions on things and if we keep it really one-sided nothing’s ever going to get done. Eryn: I want to give international students, but especially any student, a voice in the student government, and I want not only for their issues to be realized, but for them to realize that they have to rise and that they have ways to speak about their needs. For example, it was recently Chinese New Year, and in New York they applied to have it observed and they get a one-day break because it’s really important in Chinese families. But here in school, we still have to work, we still need to go to class and have exams, and many students actually complain on social media but they don’t know how to voice their concerns or to find a way to improve this. So that’s what I want to do. What issues do you believe are important to the student body and how will you address them? Adeel: We’re running on a lot of issues, our platform is 14 pages, so it’s very long, very in-depth, and it touches upon everything. But if I’m thinking about the biggest things that are happening right now at Rutgers, the protest policy is something that definitely needs to be revoked. I know there’s a lot of students that think that the policy is ultimately not that bad and that it’s there to protect the safety of students. I don’t think it’s a coincidence that this policy was passed after Trump got elected, and you know we had the two biggest marches in the history of Rutgers happen in the past year. And then the administration says, “Why don’t you just sit down with us and figure out how to do a protest?” There are two things, one: if you look at all the major protests done in the past, it’s not people sitting down with people that they’re protesting against. If I’m protesting Barchi I’m not gonna ask him if I can sit down with him and ask how to protest against him – that’s very weird. Second, I found that the process is very complicated. There’s a lot of parts of the policy that show that the administration isn’t really working with us. In my opinion it’s unconstitutional. Other than the protest policy, we also want to make a coalition for the governing associations of Rutgers – New Brunswick, Newark and Camden. People don’t really have the chance to communicate with each other. We have our meetings, but we don’t have the opportunity to really talk to each other about what it’s like at our respective schools. I think that’s really important if we’re gonna do stuff like try to get a student representative on the Board of Governors, or do things that touch the university and its three campuses as a whole. I also want to add at least 2 more external representatives to RUSA – one for international students and a representative for Rutgers Students with Children. Those are communities that need to be represented especially within RUSA. I also want to raise the minimum wage for on-campus workers to $15 – a lot of people think this is something that cannot be accomplished but we have plenty of money in our unrestricted reserves. The University of Minnesota, also a Big 10 school, has a $15 minimum wage for their student workers so there’s no reason why we can’t do that too. I’ve also noticed that commuters are really an untouched population here, one thing I’m trying to do as part of RCSA (Rutgers Commuter Student Association) is create a commuter handbook with resources and help – I’m still trying to get it approved so that it can be released maybe at New Student Orientation maybe this summer or next. We’d also like to make sure that resources for international students are also included in syllabi so that class policies are clear for them as well. And we also want to make sure that students with children aren’t penalized for having to take care of their kids. Nimra: So the issues that are really close to me are the off-campus and commuter students – I used to be off-campus and now I’m a commuter so as someone I’ve seen both sides. Having a commuter lounge on every campus is important, to be real not every student has class on Busch or Douglass. We spend a large amount of our days here getting our educations and going to class, sometimes things happen and your schedule isn’t well aligned so you have large gaps in your schedule that you don’t know what to do with. It takes a toll on your mental and physical health and that’s something I want to do something about. I’ve seen commuters spend time in the libraries overnight during exams week because they have an exam in the morning – they can’t go home, the ride is too long and they’re afraid they’re going to miss their exams the next morning. I also think we should push towards better mental health resources – we’re all students, we might work in addition to studying and there’s a hundred other things in our lives that might happen on top of that. We go through things on a daily basis. Getting mental help out there and letting students know that exists and diverting away from the stigma is a very important issue. We’re doing a good job, but the stigma is still there and we need to work on it. Another thing is sexual assault. Ever since I came to Rutgers, I’ve definitely seen an improvement in how we’re advocating against it, but there’s so much more to do because every year it happens. Whether it’s bringing influential people, rallying, we need to educate our students on what it is, how to prevent it, and how to help people who have been victims of it. I’m also a big advocate for lactation rooms for students who are mothers – we had Rutgers Students With Children come to one of our meetings and we learned about a mother who couldn’t breastfeed because she was a student and she ended up losing part of a relationship with her child. I’ve been to other universities that had lactation rooms in every building but I realized we don’t have any here. If you’re a parent but also have the courage to still go to school, then you deserve a lactation room and you deserve to have your needs met. You can’t prioritize one over the other, they’re both important and you’re trying to do both at the same time. Eryn: Adeel and Nimra covered a lot, but I would say that like I’ve mentioned, international student issues are very important to me. For them, tuition is already very high so they become off-campus and commuter students as well. I want to focus on their tuition and the issue of on-campus jobs – it’s not easy to get off-campus jobs because of visa statuses. Another issue that’s important to me is women’s rights and the opportunities for women on campus. How will you mobilize students to vote in the election and why does it matter? Adeel: Letting students know that it’s not just their voices that make a difference but also how much they’ll be affected by everything. A lot of people think, oh, I’m just chilling here, I’m living out my four years here and I’ll get a degree and move on so why should I care? But the fact is, your four years could be better. If you’re struggling, your student government can help make it better, if you’re not struggling…it could always still be better! Our ticket name is UnscrewRU, a lot of people may have professional ticket names and we had a lot of options like that for ours as well, but I purposely chose that name – not even to be funny, but because I know it’s something that students actually relate to. When we say the “RU Screw,” it’s something that we might go through, it’s inconvenient and it happens here at Rutgers that we get screwed over but it’s out of our hands. We think that we can’t do anything about it, but if we speak up and mobilize, there are things that we can do about it. When students realize that, and that you can make a difference by going out to vote, and that there are people trying to restore all those instances where we get screwed, people will vote. That’s what we’re here to do, that’s why we’re running together, that can push others to really vote for us. Nimra: For me, my Rutgers has experience has been good. I’ve had my struggles, I’ve been through the RU Screw but if you compare our university to many different universities around the country, Rutgers does a lot for its students, and there are so many resources. But that doesn’t change the fact that there is so much more that we can do for students, there is so much more that we can provide. That’s what we want to advocate, if you truly take advantage of your time here and take advantage of the fact that you have a voice, we can make your experience even better. And every Rutgers student has the right to an amazing undergraduate and graduate experience. I know many students who are struggling, and it bothers me because they don’t deserve that, and it is because so often they are “screwed” by the system. So for me if we’re able to avoid that or even help improve their experience in any way, then I’ll feel like our ticket has done its job. If I’m able to advocate for you, be a voice for you, then I’ll have done my job – your experience here matters. Eryn: For me, we want to promote change genuinely, not through propaganda. When we campaign to other students, they may ask “What does that mean to me?” We want people to know that we can solve their problems, and hopefully that will have them vote for us. Sometimes they might think that the problems we are fighting against have nothing to do with them, that the school won’t look at their problems, or even do anything about it. But if we can show that we really do care about them and their issues, they will naturally come to us and trust us. What differentiates you from the other tickets that are running? Adeel: I’m a person who’s been in touch with both the student government and the activist community so I know what it takes to build bridges. We’re the ticket that’s willing to build bridges and bring every community together. Everybody cares about issues and they have good intentions, but they have different ways of going about it. Everyone’s focused on the way they’re going about things, but why don’t we focus on the destination, which is the best possible environment for all students? So when we all have a common goal, why don’t we sit down and use all our unique roles to work together to tackle the issues. We’re all one school but if one part is missing then it won’t work. We’re going to be here to serve the interests of students. We’re also trying to reach out to international students and cultural organizations that don’t even have a voice. We’re running a ticket based on ethics rather than being in it to win it. Those quieter voices are just as powerful as the big ones. Nimra: We’re definitely trying to branch out to students that you don’t usually see in RUSA, so it’s a breath of fresh air. It’s a big part of the diversity and inclusivity issue. Our ticket is very diverse and we have very different minds working together. And when I see that, it makes me so happy, especially when you see the same faces over and over again in the student body government for years on end. It makes you start to question what is going on? Why aren’t we seeing new faces? RUSA makes an impact on the student body, so we need all types of people. One of the reasons why I decided to run with Adeel and Eryn was because I don’t question their intentions when they talk to me and tell me, “This is what we want, and why.” I want cooperation among everybody in student government. And sometimes you do question the integrity and intentions of other people, so it shows we’re not doing it just for the title. A lot of people do that. But people can tell with someone, whether they’re honest or true to their intentions, so I can tell you truly that our intentions are in the right place. We are trying to make an impact, and we are trying to include people who aren’t included on a regular basis. Eryn: I agree with what Nimra said about intention, and I think every ticket is trying to improve our campus. We’re all campaigning, tabling, posting on Facebook, but we’re reaching out to groups and organizations that were not included before. We’re trying to reach out and have person-to-person meetings with them, and to keep revising and improving our own platform as a result. To learn more about where UnscrewRU stands on other issues and to see the full list of candidates, you can visit their website. Voting will close March 27th at 11:45 P.M. Cast your vote here.